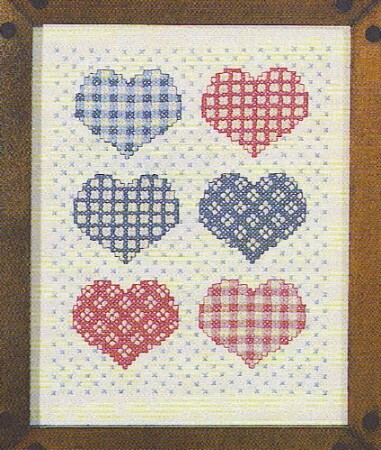 This cross stitch printed sampler craft kit blends an array of quilted hearts into one scene.A patchwork confection of quilted hearts that could be a motivation for one to attempt making a quilt. I am so happy to have discovered this wonderful website! After growing up in Mexico I have always loved printed cross stitch ! Now I can finally do the craft I was grown up with. This company takes their products to such a higher level! I will never order from anyone else again! They are my new go to for all my crafts! I love them & their customer service has been excellent! I love to needle point, so I thought that this is a very cute picture. I was really excited to find this. It was a Christmas gift for my 10 year old granddaughter. She has watched me embroider baby quilts for my grandchildren and wanted to learn how. My disappointment was in how small the "x's" are. I was hoping that they would be like the ones on the baby quilts. Perhaps with some guidance Rose will be able to have a pretty sampler.